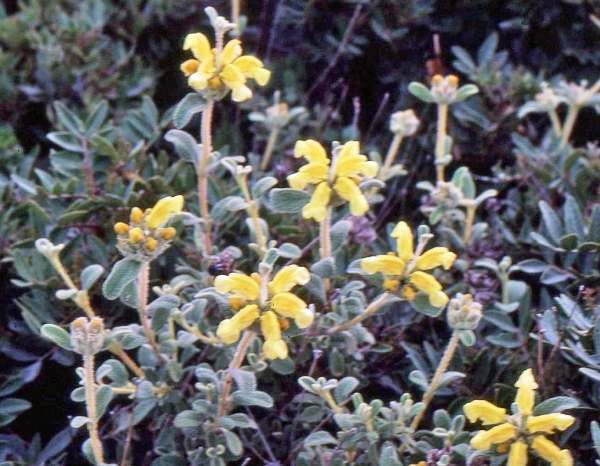 Phlomis lanata is one of three Phlomis species that occur in Crete; it can be differentiated from the other two by its leaves, which are smaller and more rounded. Of these three species, Jerusalem sage Phlomis fruticosa is the rarest and, although similar in appearance to Phlomis cretica, Phlomis fruticosa is a much larger shrub. Phlomis lanata, the only other Phlomis known to occur in Crete, has much more rounded leaves than Phlomis cretica (which can also be found in southern Greece). 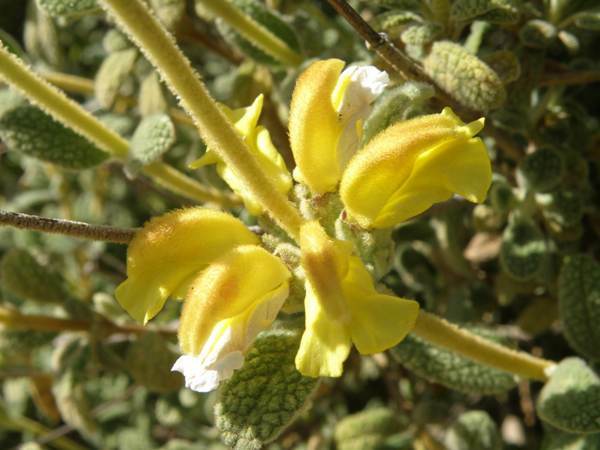 Phlomis lanata is endemic to Crete, and yet it is sometimes referred to as Dwarf (or Woolly) Jerusalem Sage! Above: Phlomis lanata has noticeably rounded leaves. Phlomis lanata grows in the habitat referred to as phrygana in Greece, and dry and stony habitat referred to as garrigue in other parts of the Mediterranean. It is a member of the Lamiaceae (mint) family of plants and it flowers from March to May. The plants shown on this page were photographed in Crete at the beginning of April.